When choosing a baby carrier for the summer and hot weather conditions there are just a few simple things to consider. Read on for our guide to carrying your baby in the heat, our quick tips will help you to choose the right Oscha Sling for you and your little one. when carrying in hot weather it is better to choose a fabric with a lower GSM. We would suggest something between 180 and 260gsm. 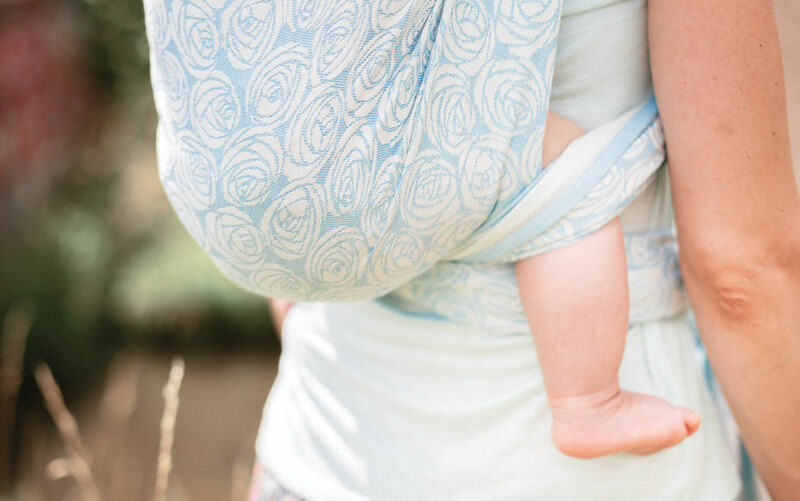 Baby wraps are a great choice for hot weather carrying. Versatile and mouldable, baby wraps provide the most comfortable carry for you and your little one. If you are carrying a smaller child then a lower GSM fabric used in single layers is perfect for hot weather carrying. If your child is heavier, you could use a multi-layer carry with a low GSM fabric to ensure you stay cool and don’t overheat under the extra layers. If avoiding ‘digging’ on the shoulders is most important to you, then you could also consider using a slightly thicker wrap for single layer carries. 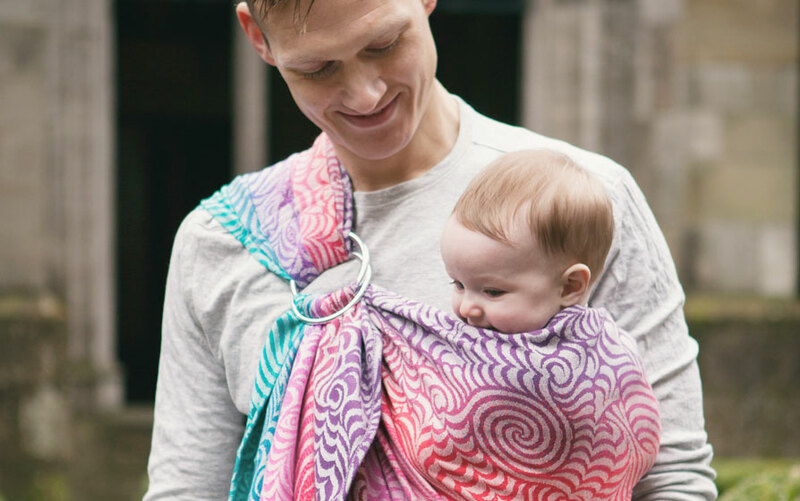 Ring slings are perfect for hot weather baby carrying as they offer a single layer carry while covering less of your body and allowing air to circulate. The long tail can be used to cover little legs, or your shoulders, from the sun! They are great for longer carries with small children, and for quick ups and downs when carrying independent toddlers. If your toddler wants to be up for long periods you might consider a fabric with more ‘cush’ such as pure bamboo, which maintains breathability while being comfy on the shoulders. Cairis carriers are also a good choice for hot weather; while slightly thicker than wraps and ring slings, being made with two layers of woven fabric, the structure of the carrier means air can circulate around you and your little one. The detachable hood is also perfect for covering your child’s head, protecting them from the sun. They are especially good for carrying toddlers and heavier babies in hot weather, as they cover less of your body but still provide comfort on the shoulders thanks to the padded straps. Fabric blend and GSM is less important with the Cairis but a lower GSM and a breathable fabric will only add to your comfort in hot weather. you should look out for when choosing a sling for summer. Ice cotton is an innovative yarn that, through advanced spinning technology, makes a cool to touch and breathable fabric. It is made with 100% Supima cotton (the finest American Pima cotton) with no synthetic fibers, and is free from harmful chemicals. Ice cotton’s unique cooling composition makes it perfect for summer carrying – we have an amazing range of low gsm wraps finished with our soft touch technique for the perfect summer weight wrap, ready to use straight from the bag. We love linen and offer a range of linen blends with something for everyone; from parents of tiny newborns to those of heavy toddlers. Linen is a very popular blend for summer slings, being light and airy yet supportive, linen blends tend to do well in single layer carries. Fine wetspun Scottish linen and wraps with a cottolin warp are usually good for carrying smaller children through to young toddlers, while high percentage wetspun linen blends are perfect for toddlers and preschoolers. As a general rule a lower linen percentage blend will give a breathable carry perfect for smaller kids, while a higher linen percentage blend will add strength and give a supportive carry all way through to toddlerhood and beyond. Bamboo can be a great choice, it offers natural UV protection and is moisture-wicking. It is soft and feels cool against your skin. We have two types of bamboo yarn: viscose and pure. Viscose bamboo yarn is finer and is great for younger children in single layer carries, For heavier toddlers we would recommend multi-layer carries when using viscose bamboo blends. Pure bamboo is slightly thicker, while still being breathable and temperature regulating, making it perfect for summer wearing from newborn through to toddlerhood. Our silk blends are wonderful for hot weather. Silk is temperature regulating and great for keeping cool in summer with its naturally breathable composition. Silk blends are easy to wrap with, being mouldable with a good balance of grip and glide. Silk blend offer a lovely support and cush for children of any weight, even when using single layer carries. Cotton is always a great all-rounder for any weather; it is soft, strong and easy to care for. Breathable and available in a range of GSMs, organic combed cotton is perfect for all ages - when carrying heavier toddlers you may find a multi-layer carry more comfortable. Wool is often underrated for hot weather and is mistakenly believed to be too warm to use. However, wool is great at regulating body temperatures, keeping you cool in the summer and warm in the winter. It is also naturally moisture-wicking and wonderfully breathable making it perfect for carrying in the heat. If you are using a woven baby wrap then the type of carry in hot weather can be important in keeping you both comfy and cool. Single layer carries are great as they mean less fabric is covering your little one. A Front Wrap Cross Carry with un-spread cross passes and the Kangaroo Carry are good choices for hot weather. Multi layer carries offer more support for bigger kids, as mentioned above if using multiple layers then it is important to choose a breathable fabric and a suitable GSM. A Poppable Front Cross Carry is a good multi-layer option as it is easy to pre-tie, avoids putting too much pressure on bare legs and is open on the sides allowing air to circulate. Hip carries can be lovely and cool as there is less body contact and less layers of fabric wrapped around you. Using a shortie wrap (a size 2 or 3) for a Slip Knot Carry can be a great choice in hot weather. You might like to carry older babies on your back, a Simple Ruck tied in front or under bum is probably the simplest and coolest carry you can do. Don’t forget to increase both of your fluids when it is warm! natural fabric or, alternatively, you could place a muslin in between you both.